Kudos to Karina of The Floured Apron for choosing a savory recipe for this week's Tuesdays with Dorie post. As seems to be the norm lately, I'm baking and posting at the last minute. It's 3:53 in the afternoon, and the scones are in the oven. I've just had a tough, emotional week, and since I had to make the Daring Bakers recipe over the weekend (I waited to the last minute for that, too!) the TWD recipe got pushed back. Making the scones today was actually therapeutic for me. I think that's what I like so much about cooking...the act of creating something and the instant gratification of eating it. And the sharing. I've shared my baked treats with the wonderful women I work with, friends who come over for breakfast, and students in my classes. 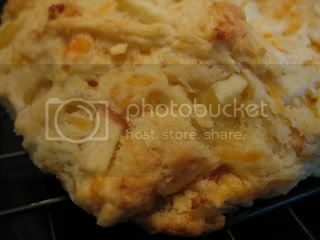 These Apple Cheddar Scones (recipe available here) are very light and moist, made with cornmeal, apple (I used fresh instead of dried), and cheddar. They aren't very sweet, as the sweetness comes from only a hint apple juice and just a few tablespoons of sugar. They are very good, and I imagine they'd be even better with crisped bacon or ham added to them! 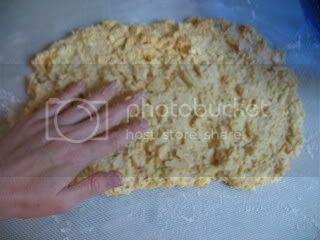 The dough is easy to work with, but very sticky! 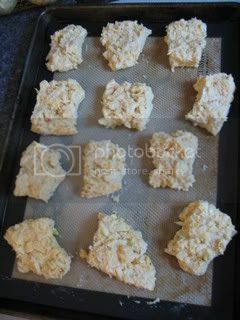 To form the scones, I patted the dough out just to form a rectangle, then cut it into 12 pieces (haphazard pieces). I ate the scones with some mesquite butter that I made by mixing about a half stick of softened butter with 1/2 teaspoon of mesquite flour to create a smoky, nutty, slightly sweet spread. 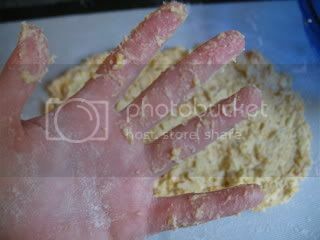 Never used mesquite flour? Check back this weekend for some more info and recipes! I'm with you on that - baking is my de-stresser, and the only way I stay sane. Your scones look lovely. Heh, I've found that baked goods taste better when created under pressure... at least, that's how I keep my procrastinating self warm at night! 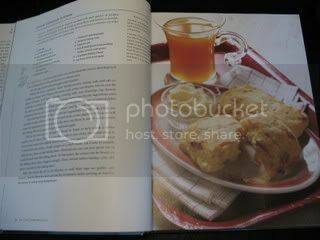 Your scones look great - and I'm intruiged by your mesquite butter - cool idea! Love the sticky hand photo. Great work! Lovely scones. Your scones look great. I bet the mesquite butter would be great on a bacon or ham and apple cheese scone. Sticky, but good! 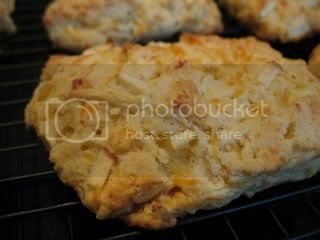 Mesquite butter and these scones sound delicious! Lovely! I look forward to hearing more about the mesquite. Baking is great therapy and so are warm tasty scones! I'm also intrigued by the mesquite flour/butter. And these scones with bacon added to them? Oh. My. Gawd. You are wicked! Those look really good, but I am having a hard time imagining apples, and cheddar together. I don't think I have ever had that combination of food. I can't imagine anything bad coming out of your kitchen though! Maybe I should just keep taking your class so I get more samples!